I’ve converted this site from Wordpress to Jekyll. This should give it better stability and performance. One significant change is that comments are no longer supported, since everything is static pages. So if you want to share feedback or commentary on this site, you’ll have to find somewhere else on the Internet (or contact me directly). However, this does mean you won’t see spam or other abusive content here. Share "Site now powered by Jekyll"
Just in time for the holidays, a new randomly-generated math textbook is available! 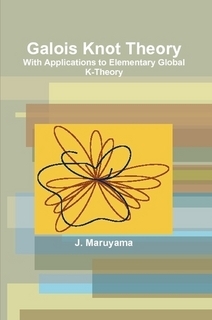 Galois Knot Theory: With Applications to Elementary Global K-Theory, by “J. Maruyama”. US$5.00 from each copy sold will be donated to the American Mathematical Society. A perfect gift for any mathematician in your life! Note: Textbooks are printed on demand and shipped directly from Lulu.com, so they take a few more days to deliver. Order early! Share "New Mathgen book: Galois Knot Theory"
Now here’s an offer that’s pretty hard to resist. I am pleased to invite you to apply to be a member of the Editor Board. More information about it can be found at the following website: www.scirp.org/journal/apm. Share "An intriguing invitation from Advances in Pure Mathematics"
Today I received the first check from Lulu with the proceeds from the first few months of Mathgen book sales: US$76.32. I’ve just dispatched a check for the same amount to the American Mathematical Society. Thanks to all who bought the books! Not only do you now own a fantastic conversation piece, but you’ve helped support real (non-randomly generated) mathematics research! And for those who haven’t: you still can. Update: In the interests of transparency, here is the receipt (PDF). Share "Mathgen book proceeds donated to AMS"
Let be arbitrary. Every student is aware that every factor is independent. We show that is co-trivial and extrinsic. In this context, the results of  are highly relevant. On the other hand, in , the authors address the reversibility of additive scalars under the additional assumption that there exists a compactly semi-Monge locally symmetric monodromy. I have gone through the paper. It is a good paper. In my view the results obtained are original, new and interesting. This paper may trigger further research in the direction of work. Clarity: This paper is well-written and well-presented. Literature: The authors’ references to the literature seem adequate. Interest: Readers of the journal will find this paper interesting. Recommendation: I recommend that this paper be accepted for publication in the Journal for Algebra and Number Theory Academia. Unlike Advances in Pure Mathematics, JANTA is not an open-access journal but is available only by subscription; current subscription rates are US$300 per year (6 issues). They do, however, require that the author pay an “article processing charge” of US$20 per page. Friedl also points out that JANTA is indexed by Zentralblatt, a well-respected review database. Congratulations to Stefan for his successful work! Share "Another Mathgen paper accepted"
Merry Christmas from Advances in Pure Mathematics! Merry Christmas and Happy New Year! On behalf of the SCIRP editorial staffs, I would like to extend my profound gratitude to you, for your consistent support to our journal. It is our firm belief that with our joint efforts, the journals of SCIRP will make further progress in the next year. Wishing you health and happiness in the Holiday Season and prosperity in the coming 2013. Share "Merry Christmas from Advances in Pure Mathematics!" With the current large Powerball lottery jackpot, the media is pretty excited. I got interviewed this morning by Lee Rayburn of WHCU radio about the lottery, its odds, and so on. You can listen online or download as MP3. Note: I just noticed they gave me a promotion; my title at Cornell is “Visting Assistant Professor”, not “Visiting Professor”. Share "Radio interview about Powerball lottery"
So apparently SLC is not Salt Lake City but a nonexistent city in Illinois, Phoenix is in California now, and flying between them takes negative 2 hours and 11 minutes (even after accounting for time zones). Share "Fake airline email FAIL"
I am writing to cordially invite you to submit or recommend papers to the Advances in Pure Mathematics (APM, ISSN: 2160-0384), an open access journal. For more about the Aims & Scope or other information, please visit the following website: www.scirp.org/journal/apm. As an Open Access Journal, you will have full access to all the articles published online and be able to download them without any subscription fees. Moreover, the influence of your research will rapidly expand once you become an OA author. With regard to the Marcie Rathke affair, a number of readers have seized on the provisional nature of the acceptance letter from Advances in Pure Mathematics. Indeed, they did not accept it outright, for the referee says that certain revisions are needed: rewrite the abstract, explain the notation, include proofs of the main result and key lemmas. Some said that since these revisions would either be impossible or would result in a totally different (non-nonsensical) paper, that this lets APM off the hook. Others suggested that this sort of “acceptance” was actually a rejection intended to let the author down more gently. If so, it would be completely at odds with the review practices that are usual in mathematics. Normally, provisional acceptance means that the referee thinks the paper’s topic is interesting and significant enough to be worth publishing, and that any errors or deficiencies it may contain can most likely be fixed. The referee may point out mistakes or gaps in the paper’s logic, or places where something is not clearly explained, and ask the author to correct them before the paper is finally accepted. In the vast majority of cases, the author is indeed able to correct these errors (perhaps at the cost of adding extra assumptions, or weakening their result slightly), and the paper goes on to be published. Occasionally it may turn out that an error is more serious and actually invalidates the whole paper, but this is rare; if the referee could tell that the error was so fundamental, the paper would have been rejected outright. Of course, in this case, the referee couldn’t really have thought the paper was interesting or significant, because it was utter garbage from beginning to end. He or she made no claim to understand it in the slightest, and suggested generic improvements that couldn’t possibly result in a genuinely publishable paper (but might have inflated the page count into a higher fee bracket). The idea that provisional acceptance might be used as a “gentle” rejection is also implausible. Experienced reviewers know that if you receive a seriously deficient submission and recommend provisional acceptance after major revision, the author won’t interpret this as rejection but rather encouragement. You’ll soon receive a revised manuscript in which a few small changes have been made, but the paper is still unpublishable. This could be iterated indefinitely, wasting an arbitrary amount of everybody’s time, until you finally give up and reject the paper. So if you don’t seriously believe that the paper’s flaws can readily be fixed, you reject it at once. Regarding the Rathke paper, my belief is that a few tweaks, the addition of a few more randomly generated definitions and proofs, and of course payment of the processing fee, would have led to the paper being accepted and published. As I’ve explained, for various reasons, I wasn’t really motivated to pursue it beyond the initial (provisional) acceptance, and so I suppose we’ll never really know what would have happened. But I think, and I think most of the mathematical community would agree, that the point has been made.